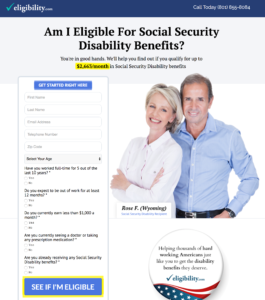 Eligibility.com helps users review over 30 government benefit programs and seek assistance to use those programs. If you are a publisher with existing traffic that may overlap with our programs, please contact us below. We are actively adding affiliate partners. Programs include Social Security Disability (SSDI), Criminal Record Expungement, Tax Debt Relief, Government-Backed Loan Programs (FHA/VA), Federal Housing, Medi-Cal and Medicare, Bankruptcy, Unemployment, and more. This offer converts on a one page submit. We have new creative available. Conversion Requirements: Basic Contact information (Name, Phone, Email) plus qualifiers on Age, Income, Work status, Benefit status. See example Landing Page. Medicare eligibility depends on age, disability, and other health qualifications. Medicare eligible individuals who are 64.5+ years of age are the main target. Conversion Requirements: Basic Contact information (Name, Phone, Email) plus qualifiers on Age and Disability. Potential clients can check their eligibility and get a free evaluation from a licensed attorney for a criminal record expungement service. One page submission lead form. Clients can have a criminal record expunged, aka “clean their record”, if they have been convicted of a felony in their state. This offer converts on a one page lead form submit. New creatives from Eligibility.com are available for 2017. Potential customers can submit their information for a free consultation from a tax debt relief service. Customers who owe money to the IRS may work with our partners to negotiate for tax relief. One page submit. New creatives for tax debt from Eligibility.com are available. Find out if you’re eligible for Affiliate Offers with our free evaluation form. Enter your state to begin.